From a rickety instrument with long antennas that constantly had to be adjusted, the television has transformed into a device with great picture quality and the ability to receive signals from all over the world. Over the years, the television has been updated to enhance the viewing experience. Signals switched from over-the-air broadcasts to cable television, and then from cable television to satellite television. The earliest forms of signal transmission for television were over-the-air broadcast signals. Large antennas at broadcast stations would send radio signals that could then be received by smaller antennas installed on top of each individual television set. The biggest problem with such a system was that the signals could not be transmitted well over long distances or in locations surrounded by mountains or forests, because the radio signals would be very weak. Cable television was first used in the United States in 1948. According to the National Cable and Television Association’s website, towns located in remote valleys and on hills had a hard time capturing over-the-air broadcast signals for television and therefore were the first to use a form of cable television. Antenna towers were built on the tops of hills surrounding these towns, and the towers were connected to each home in the town through long cables. Since the signal passed through underground cables instead of through the air, it was not hampered by obstacles. A number of amplifiers were installed along the cables in order to prevent the loss of the signal over long distances. Such systems of antennas connected to cables were soon known as community antenna television (CATV) stations. CATV stations gradually began to gain popularity: The antenna towers were able to pick up signals from long distances, allowing viewers to have a wider variety of television programming. According to www.howstuffworks.com, the next milestone in cable television came in the 1970s when a cable service called Home Box Office (HBO) introduced the idea of having paid channels on television. For this purpose, HBO began sending signals to a satellite orbiting the Earth. The satellite then transmitted the signals to dish antennas located in Florida and Mississippi. Cables connected to the dish antennas helped transmit these signals to individual homes. This new system of transmitting signals allowed for a much better signal quality and was gradually used all over the country. Around the same time that HBO pioneered the use of satellites for signal transmission, fiber optic cables began to be used for carrying the signals from the CATV stations to individual houses. These cables prevented signal loss, eliminating the need for having amplifiers along the cable. Modern cable television follows the basic premises of the satellite and fiber optic cable technology described here. Although cable television is still quite popular, today many are switching to satellite television. Satellite transmission works with the help of geosynchronous satellites, which move in sync with the Earth so their relative position with respect to Earth’s surface remains fixed. Individual dish antennas are installed by each user, and these can be adjusted to pick up signals transmitted by a particular satellite or group of satellites in the same area. Broadcast centers transmit the signals corresponding to different channels and programs to the satellites. 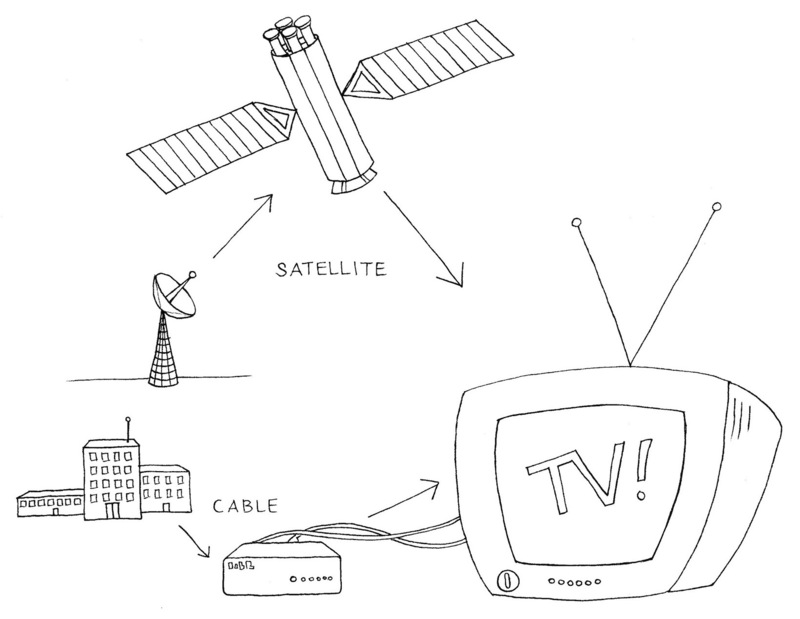 The satellites then transmit the received signals back to individual dish antennas in the viewer’s home. The dish antennas transmit the signal to a receiver, which finally sends the signal to the television set. As explained on www.thesatellitetvguide.com, satellite television provides many advantages over cable television, the most significant one being the wide variety of channels one can watch with satellite television. Satellite television also offers better picture and sound quality than cable television.